Since being launched in the 1990s the Yamaha Pacifica range of guitars has proved to be extremely popular with both novice and more experienced guitarists. Based on the best selling Pacifica 112 the Yamaha Pacifica 012 electric guitar represents an excellent and affordable entry level superstrat. 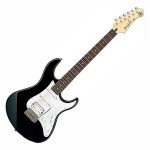 The Yamaha Pacifica range of guitars was launched in the 1990s at the height of the superstrat era. The line was originally designed in Yamaha’s California based custom shop by Rich Lasner and Leo Knapp. It had been intended that the Pacifica would be a test project but Yamaha liked the finished guitar so much that they decided to put it into production. The decision to do so has certainly been vindicated as the Pacifica has gone on to be an extremely popular guitar as it combines excellent build quality with a versatile design at an affordable price. So what does the Yamaha Pacifica 012 have to offer? The Yamaha Pacifica 012 electric guitar is based on the best-selling Pacifica 112 but firmly fits into the affordable starter guitar mould. It can be viewed as being a typical superstrat style guitar with a contoured double cut-away body. The body itself is made from Agathis, a wood commonly used in the manufacture of low priced guitars due to its good resonating properties, yet relatively low price of production. I have to admit to never having played a guitar made from Agathis before, but the tone resonating from the guitar unplugged was good and strong and it felt solid and robust so no complaints there. The bolt on neck is maple with a rosewood fretboard fitted with 22 jumbo frets. The actual firepower of the guitar comes in the shape of the traditional superstrat standard, a humbucker in the bridge position and two single coil pick-ups in the middle and bridge positions. The full tonal range of the guitar is accessed through the five position selector switch which gives you a complete choice of the pick-up combinations. The guitar is also fitted with a master volume and master tone giving excellent control of the tonal range capable from this guitar. Finally the guitar has a vintage type tremolo which is relatively stable allowing some whammy bar tricks without de-tuning the guitar. Plugged in the guitar really shows its Yamaha pedigree. The body is light but solid, the neck plays well and with the deep cut-aways it is easy to access the upper frets. The pick-ups are responsive producing a nice clean tone but it is when you crank up the distortion and access the humbucker that the guitar really starts to sing. The vintage style tremolo is stable but as is the case with this kind of tremolo it does not allow for a sustained whammy bar assault. In summary this is a good guitar as long as you bear in mind the sub £200 price tag. At this price point you are not going to get all the bells and whistles but you know that with Yamaha the quality is going to be good. The Yamaha Pacifica 012 electric guitar is a solid entry level model which should stand you in good stead as you develop your playing style.